Obtain electrocardiography (ECG), transthoracic echocardiography (TTE), and/or chest radiography in all individuals with suspected acute pericarditis. Evaluate markers of inflammation (ie, C-reactive protein [CRP]) and myocardial injury (ie, creatine kinase [CK], troponin) when acute pericarditis is suspected. Obtain TTE in all patients with suspected pericardial effusion (class I). 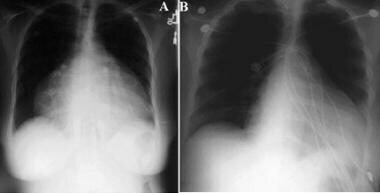 Obtain chest radiography in patients with suspected pericardial effusion or pleuropulmonary involvement (class I). Evaluate markers of inflammation (ie, CRP) in patients with suspected pericardial effusion (class I). Consider computed tomography (CT) scanning or cardiac magnetic resonance imaging (CMRI) when loculated pericardial effusion, pericardial thickening and masses, and associated chest abnormalities are suspected (class IIa). Obtain echocardiography as the first imaging modality for suspected cardiac tamponade to evaluate the size, location, and degree of hemodynamic impact of the pericardial effusion. Perform urgent pericardiocentesis (or cardiac surgery) for cardiac tamponade. To guide timing of pericardiocentesis, a judicious clinical evaluation including echocardiographic findings is recommended. Obtain TTE and frontal and lateral chest radiographs in all patients with suspected constrictive pericarditis. Obtain CT scanning and/or CMRI as second-level imaging to evaluate calcifications, pericardial thickness, and degree and extension of pericardial involvement. Cardiac catheterization is indicated when noninvasive diagnostic methods do not provide a definitive diagnosis of constriction. For a definitive diagnosis of viral pericarditis, perform a comprehensive workup comprising histologic, cytologic, immunohistologic, and molecular studies in pericardial fluid; consider peri-/epicardial biopsies (class IIa). Perform urgent pericardiocentesis for the diagnosis of purulent pericarditis Send pericardial fluid for bacterial, fungal, and tuberculous studies, and draw blood for cultures. Perform pericardiocentesis for cardiac tamponade for symptomatic relief and diagnosis of malignant pericardial effusion, and obtain cytologic analysis of the pericardial fluid to confirm the diagnosis (both class I). Consider pericardiotomy when pericardiocentesis cannot be performed (class IIa). Consider pericardial or epicardial biopsy to confirm the diagnosis of malignant pericardial disease (class IIa). Consider tumor marker testing of pericardial fluid to differentiate between malignant and benign effusions (class IIa). Consider thoracentesis with adenosine deaminase (to evaluate for tuberculosis) in addition to conventional studies in patients with a pleural effusion. Pericardiocentesis should be performed on all patients with cardiac tamponade or suspected purulent pericarditis. Tension pneumothorax may mimic cardiac tamponade. Trauma ultrasonography has limited this misdiagnosis. If echocardiography is unavailable, placement of a central venous pressure (CVP) line may reveal increased right-sided pressures. CVP measurements more than 12-14 mm Hg are usually found in cardiac tamponade. The diagnosis of rheumatoid arthritis (RA) pericarditis is suggested by serous or hemorrhagic pericardial fluid with a glucose level of less than 45 mg/dL, a white blood cell (WBC) count higher than 15,000/µL with cytoplasmic inclusion bodies, a protein level higher than 5 g/dL, a low total serum hemolytic complement (CH50), a high immunoglobulin G (IgG) level, and a high rheumatoid factor. Cholesterol levels may be high in the fluid of patients with RA who have nodules. In patients with rheumatic fever pericarditis, the antistreptolysin O titer is usually greater than 400. Rarely is a large effusion present. When evaluating for tuberculous pericarditis, the diagnostic yield for acid-fast bacilli (AFB) in pericardial fluid is fairly low (30-76%). Pericardial biopsy has a much better yield (approximately 100%). Elevated adenosine deaminase in pericardial fluid is useful for diagnosing tuberculosis; studies note greater than 90% sensitivity and specificity with levels higher than 50-70 U/L. Elevated interferon (IFN)-gamma levels in pericardial fluid are also indicative of tuberculous pericarditis. In neoplastic pericarditis, the pericardial carcinoembryonic antigen (CEA) level is often elevated. Cytology findings are positive in 80-90% of breast and lung cancer cases, but the percentage is lower in other malignancies. Obstruction of the lymphatic drainage can cause the pericardial effusion to be more significant than the tumor mass. Obtain a CBC count with a differential. Significant leukocytosis may be present with an either inflammatory or infective cause of pericarditis. Also, determine prothrombin time/activated partial thromboplastin time (PT/aPTT) and, if abnormal, correct in order to lessen the chance of developing tamponade. Determine serum electrolyte (ie, sodium, potassium, chloride, magnesium, calcium, phosphate) concentrations because of the increased risk of cardiac arrhythmias in patients with pericarditis. In addition, during dialysis, frequent monitoring of electrolytes is helpful to detect and treat hypokalemia and hypophosphatemia, especially in patients with dialysis-associated pericarditis. Blood urea nitrogen (BUN) and creatinine levels can be measured to evaluate for uremia. These levels are often elevated with azotemia. Evaluate cardiac biomarkers, such as creatine kinase and isoenzymes levels, as well as LDH and SGOT (AST) for associated myocarditis or myocardial infarction. Troponin I may be elevated in viral or idiopathic acute pericarditis. Chest radiography is not helpful in uncomplicated pericarditis. Patients with small effusions (less than a few hundred milliliters) may present with a normal cardiac silhouette. In one study, pleural effusions were seen in 33% of patients with pericarditis. Approximately 75% of the effusions were left-sided only. A flask-shaped, enlarged cardiac silhouette may be the first indication of a large pericardial effusion (200-250 mL of fluid accumulation) or cardiac tamponade (see the following image). This occurs in patients with slow fluid accumulation, compared with a normal cardiac silhouette seen in patients with rapid accumulation and tamponade. Thus, the chronicity of the effusion may be suggested by the presence of a huge cardiac silhouette. Go to Imaging in Constrictive Pericarditis for complete information on this topic. Although transthoracic echocardiography remains the initial test of choice for detecting pericardial effusions and diagnosing tamponade, this study is limited in its capacity to reveal the entire pericardium and its operator dependence. Nonetheless, echocardiography is particularly helpful if pericardial effusion is suspected on clinical or radiographic grounds, the illness lasts longer than 1 week, or myocarditis or purulent pericarditis is suspected. This study is helpful in quickly confirming the diagnosis, particularly if cardiac tamponade is suspected,  and it can also be used to evaluate for chamber size and ventricular dysfunction. Any form of pericardial inflammation can induce pericardial effusion. It is important to note that the pericardium may have a normal appearance in pericarditis, without evidence of fluid accumulation. M-mode is used to evaluate pericardial fluid and timing during the cardiac cycle; it demonstrates persistence of the echo-free space between the parietal pericardium and the epicardium during this cycle. Fluid is distributed from the posterobasal left ventricle apically and anteriorly, then laterally and posteriorly to the left atrium. Fluid adjacent to the right atrium is an early indicator of an effusion. Other causes of echo-free space that must be considered include pleural effusion, pericardial masses, and epicardial fat. To a limited extent, an echocardiogram can characterize the effusion. Very small effusions are located posterior and inferior to the left ventricle. Moderate effusions extend toward the apex of the heart, and large effusions circumscribe the heart. Weitzman criteria define a moderate effusion as an echo-free pericardial space (anterior plus posterior) of 10-20 mm during diastole and a large effusion as an echo-free space more than 20 mm. A “swinging heart” may be present with large effusions. This is characterized as counterclockwise rotational movement, which occurs in addition to the triangular movement of the heart, producing a dancelike motion. Thin fibrous strands within the pericardial space can be seen in acute effusive pericarditis. Shaggy exudate may indicate a potentially difficult pericardiocentesis, but this finding is not diagnostic. Echocardiographic studies have noted pericardial effusions in 50% of patients with rheumatoid arthritis (RA) with nodules and in only 15% of patients with RA without nodules. In patients with sarcoidosis, this study shows that pericardial involvement is present in 20% of cases; however, patients may not have significant myocardial infiltration. 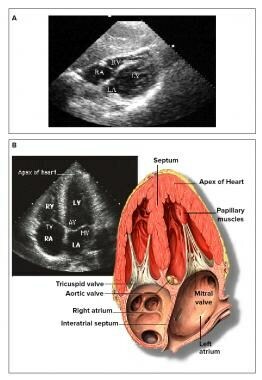 An example of an echocardiographic image is shown below. In the emergency department, there may be difficulty using the classic textbook ultrasonographic findings of tamponade, as the trauma patient is often tachycardic and the examination abbreviated. A dilated inferior vena cava (IVC) without inspiratory collapse (plethora) is highly suggestive of tamponade. Effusions are easily detected through different radiographic coefficients of fluid and the pericardium. Similarly, the nature of the effusion may be surmised, given the different attenuation coefficients for blood, exudate, chyle, and serous fluid. However, hemopericardium may be difficult to assess without intravenous contrast, because blood has the same radiodensity as myocardium. An advantage of CT scanning over other imaging modalities includes its capacity to detect pericardial calcifications. Magnetic resonance imaging (MRI) can miss significant calcium deposits. The presence of any calcification is important in patients suspected of having constrictive pericarditis. CT scanning is also less operator dependent than ultrasonography. Limitations of CT scanning include the need for contrast administration, patient exposure to ionizing radiation, and difficulty in differentiating fluid from thickened pericardium. Magnetic resonance imaging (MRI) can provide anatomic details of the pericardium and heart without ionizing contrast or radiation. The normal pericardium can be up to 4-mm thick. Limitations to use of MRI include the need to gate the image acquisition. In addition, a high-quality MRI may need more than 250 regular heartbeats; thus, the examination may be limited in patients with arrhythmias. Electrocardiography (ECG) can be diagnostic in acute pericarditis and evolves in 4 stages. However, only 50% of patients with pericarditis experience all four stages. An important ECG finding is PR-segment depression, which has been reported in as many as 80% of viral pericarditis cases. 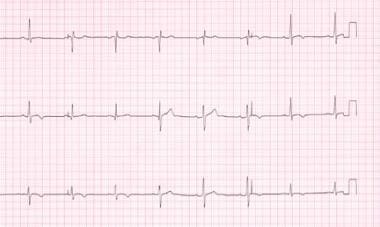 Electrical alternans is pathognomonic of cardiac tamponade and is characterized by alternating levels of ECG voltage of the P wave, QRS complex, and T waves. This is a result of the heart swinging in a large effusion. Stage 1 accompanies the onset of acute pain and is the hallmark of acute pericarditis. ECG changes include diffuse concave upward ST elevation, except in leads aVR and V1 (usually depressed). 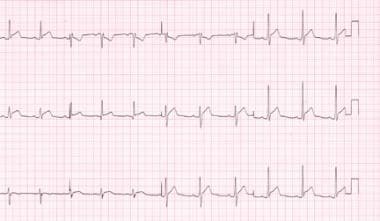 T waves are upright in the leads with ST elevation, and the PR segment deviates opposite to P-wave polarity. See the image below. Stage 2 occurs several days later with the return of the ST segment to baseline, followed by flattening of the T waves. T waves become inverted in stage 3 but without Q-wave formation. Finally, in stage 4, the ECG returns to the prepericarditis baseline weeks to months after the initial onset (see the following image). The T-wave inversion may persist indefinitely in the chronic inflammation observed with tuberculosis, uremia, or neoplasm. ECGs often fail to demonstrate the diffuse ST- and T-wave elevations observed in idiopathic pericarditis because of the lack of penetration of inflammatory cells into the myocardium. In fact, the presence of these changes on ECG mandates a search for an alternative cause for pericarditis. In patients with RA pericarditis, ECGs almost never demonstrate typical findings. In contrast, lupus pericarditis findings on ECG usually demonstrate typical changes of pericarditis. In uremic patients with pericarditis, ECG commonly does not show the typical ST-T segment changes due to lack of inflammation; in hypothyroidism, low ECG voltage is often observed due to the presence of a large effusion. Regional ECG changes may be present in infarction-associated pericarditis. If the pericardial involvement is confined to the infarction zone, stage 1 ECG findings are often not seen. Positive T waves that last longer than 48 hours after an acute MI or premature reversal of inverted T waves may indicate pericardial involvement. An ST-segment–to–T-wave ratio of 0.25 or more in lead V6 helps distinguish acute pericarditis from early repolarization. In Dressler syndrome, ECG findings may demonstrate diagnostic changes of acute pericarditis, especially if the ECG findings normalize after the infarction. This procedure is relatively safe when guided by echocardiography, especially with large free anterior effusion. One study noted only 3 minor complications in 117 procedures with ultrasound guidance. Conversely, blind percutaneous pericardial puncture increases the risk of complication to 5-50% and should be performed only in an emergency. Complications include fatal cardiac laceration. In a large study, diagnostic pericardiocentesis led to a diagnosis in only 6% of cases, versus 29% diagnosed with therapeutic pericardiocentesis. As such, pericardiocentesis should not be performed unless tamponade or suspected purulent pericarditis is present. If a pericardiocentesis is performed for drainage, an indwelling catheter should be placed in the pericardial space for continued drainage over several days. If the catheter continues to drain a large amount, a more definitive procedure should be performed. The traditional approach is the subxiphoid technique. This technique avoids injury to the coronary arteries, as follows. The chest is prepared with Betadine and a 16-gauge to 18-gauge needle is introduced between the xiphoid and the left subcostal margin. The needle is directed toward the inferior tip of the left scapula with slow advancement and with aspiration. If fluid is found, the needle is exchanged for a catheter over a guidewire. Fluid is removed via the catheter. The catheter may be sutured in place for subsequent use. Alternatively, a 16-gauge to 18-gauge spinal needle may be used for one-time drainage. Echocardiographically guided pericardiocentesis has evolved over the past 20 years and is now considered the procedure of choice for removal of pericardial fluid. This technique differs from traditional blind pericardiocentesis primarily in the site of needle entry, in which the left chest wall has become the preferred location for needle entry. The intended needle trajectory is investigated with echocardiography to confirm the optimal direction and depth for needle advancement. A 16-gauge needle (with poly-Teflon sheath) is advanced in a straight line without side-to-side manipulation. Needle position can be established via echocardiography while agitated sterile saline is injected. Assess the size, distribution, and ideal needle entry site and trajectory with a 2.5-MHz to 5-MHz ultrasound transducer placed approximately 3-5 cm from the parasternal border. Locate the point where the effusion is closest to the transducer as well as an area of maximal pericardial fluid accumulation. Assess or measure the distance from the skin to the pericardial space. The needle trajectory is established by the angle of the transducer. Keep this trajectory in mind during the procedure. Use a sterile skin preparation such as povidone-iodine and, if readily available, a transparent sterile plastic sheet (one author recommends a 1030 Baxter drape) to allow imaging and a sterile field. Place a sterile 16-gauge catheter on the predetermined location on the chest wall, avoiding the inferior rib margin. Advance in the predetermined direction, angle, and depth. Advance 2 mm further once fluid is obtained. Consider leaving the catheter in place after removing the needle. If needed, a guidewire can be advanced through the catheter. The pericardial fluid should be analyzed for red blood cells (RBCs), total protein level, LDH level, adenosine deaminase activity, and culture (ordinary and Loewenstein media). Directly investigate for tuberculous bacilli and perform a cytologic study. The fluid in purulent or suppurative pericarditis from is usually 400-500 mL in volume and shows a thin to creamy pus. The fluid in RA and SLE pericarditis demonstrates few polymorphonuclear neutrophils, lymphocytes, or histiocytes. The usual volume is 50-200 mL and accumulates slowly. Also found in SLE pericardial fluid is a high protein level, low-to-normal glucose level, low complement, and, possibly, a pH level of less than 7. In addition, fluid analysis reveals positive autoantibodies, such as ANA or anti–double-stranded DNA. Pericardial fluid in scleroderma has a protein value greater than 5 g/dL and a low cell count, but it does not demonstrate the antibodies found in RA and SLE. In uremic pericarditis, adhesions are present between the pericardial membranes, which are thickened, which frequently result in bloody effusions. In hypothyroidism, pericardial fluid is often straw colored with high protein and cholesterol levels and with few cells. If tamponade recurs after pericardiocentesis, perform a pericardial biopsy with histologic and bacteriologic examinations of the pericardium. If significant clinical activity persists for 3 weeks after admission and without an etiologic diagnosis, some authors recommend pericardial biopsy. Cardiac catherization is used for assessing pericarditis and tamponade. This procedure can evaluate constrictive pericarditis versus restrictive cardiomyopathy.